It's hard to believe that 2016 is already coming to a close, and I'm the first to admit I'm in a bit of denial. I mean, where on earth has the year already gone? This year has definitely been a whirlwind so far, and of course, the momentum continues with a myriad of fun events approaching to help plan and attend that will wrap up the year on another high note. From friends' housewarming parties, baby showers, weddings, and the like, there are also the dutiful corporate events to attend. And whether you celebrate the holidays or not, you always want to look your best and dress appropriately at any of these special events. To help with your outfit planning, today's look is the first I have prepared in a series of seasonal looks that I have curated to ensure you look pretty and polished, no matter the event. This first look is ideal for office parties, luncheons, dinners with a business-professional dress code. It incorporates a few of my favorite things: delicate lace, luxe suede, darling bows, and a little embellishment in the form of sparkly, faux jewels. Pairing an eyelash-lace pencil skirt in a gorgeous shade of bordeaux with a dark grey, embellished sweater is a pretty, seasonal combination. It's office-appropriate with the modest, knee-length skirt and an elbow-length sweater, yet still dressy with a hint of festive flair thanks to the feminine lace of the skirt and the embellished neckline of the sweater. And would you believe this skirt is a mere $11? I know! I could hardly believe it myself; it looks far more expensive and comparable to some designer skirts in this style. It really underscores the point that fashion/style doesn't have to break the bank; you just need to search for well-fitting pieces with special details that make it unique and beautiful. I've had this skirt for years (and it remains in stock!) and it has served me well through numerous parties, date nights, and other special events. It is fully lined and fits well without any alterations, albeit slightly loose in the waist. The lace is beautiful and very delicate, so you will need to take care not to snag it with your jewelry or unfiled nails. An embellished sweater is a great option for corporate events as well. It adds a hint of sparkle at the neckline, catching the eye and serving as your statement jewelry. If you wanted, you could also add matching or similar statement earrings, but I would caution against pieces that are too large or "busy" since they will compete with the neckline. I find that at corporate parties/events in particular, less is more. For this look, I added a classic navy coat and color-blocked wool blazer -- either of which work well to add warmth and structure to the outfit. The navy color is rich and saturated, pairing nicely with the color of the skirt. My exact sweater is old from Ann Taylor, but I'm loving this embellished sweater here, here, and here. Any neutral color will work well, but I chose a dark grey for this look to complement the deeper, jewel tones of the skirt and accessories. 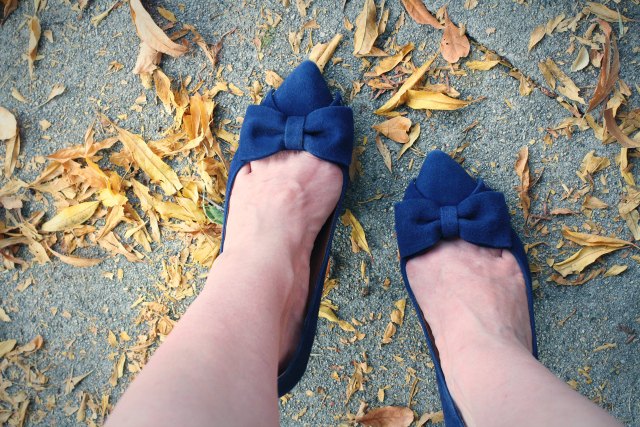 Navy suede bow pumps and a navy satchel also add nice, textural elements to the overall look. If you tend to lean towards more feminine looks on the whole like I do, then these bow pumps are a darling option here, here, or here. Or, if you prefer a more contemporary and classic look, which is also near and dear to me, then you could easily swap out the bow pumps with a simple and sleek pair of suede navy or grey pointed-toe pumps. A pair of metallic, shimmery pumps would also work beautifully to dress up the look even further, but of course, it all depends on the event itself. I would probably reserve shimmery pumps for a more formal evening event, i.e. corporate dinner party. I hope you find these ideas helpful for your next corporate luncheon/dinner, and that they serve as inspiration and a springboard for your own style and creativity for your upcoming event! Stay tuned for more seasonal, special-event looks coming to the blog soon! I absolutely love this outfit! The skirt is such a perfect one for the office! Hi, Lee! I'm so sorry for the late reply but just wanted to thank you so much for your sweet comment! This skirt has really surprised me with its quality and versatility, especially for such a great price! Beautiful outfit for an office luncheon party. I am so glad to find this post. Actually at some domestic corporate events Chicago venue there is our office dinner bash and I needed such dress ideas to look good while carrying formal look. Thanks a ton for this post!